Have you ever been the last of a once thriving village, or been birthed to an eve who had no idea what she was doing? Well rather than talking to your brother and uncle about the town being dead, or trying to pathetically tell your mom she started in the worst spot, or intentionally stepping on a snake, Ol' Grim's got an option for ya. Go out and find something or someone! 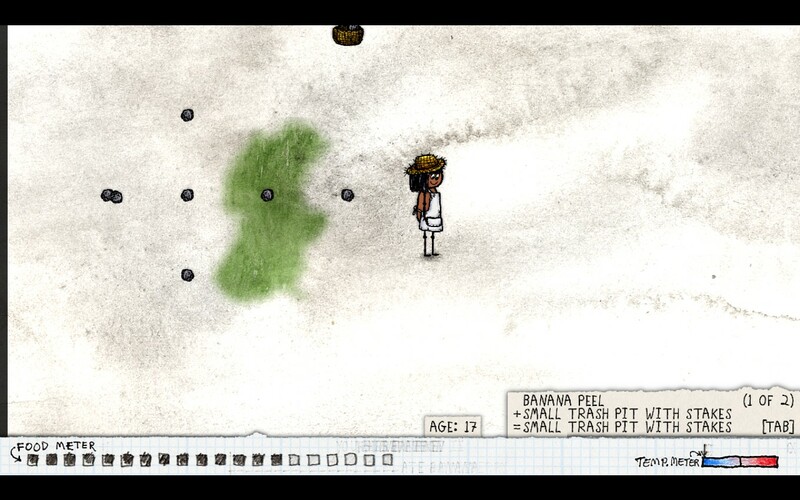 Thanks to thundersen (and others) I have finally begun to develop a system for searching that will net you the best results and increase the chance of you finding other established towns, both living and dead. Ill try to break this down into two basic parts, When and how to find others, and what can be done to help the search effort. So whatever circumstances placed you in this scenario where finding others is now your goal, the first step should to always choose a starting point in which to search. The very first thing that should be done is place a home marker for reference. The closer to where you are born the better. Now that you have a start, The next step is knowing HOW to travel. 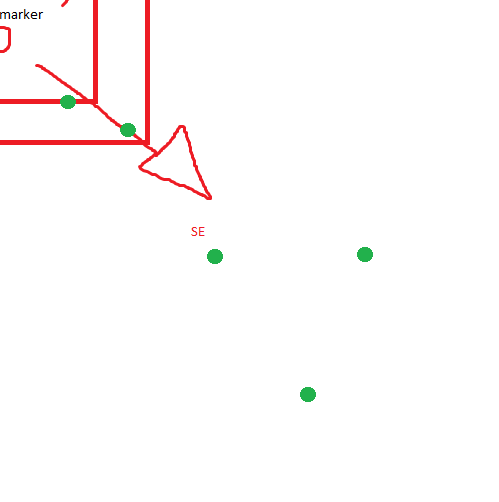 Using birth coordinate data mixed with eve spiral info, the best route is heading diagonal directions. Spawn points are often only 250 to 500 tiles away diagonally (albeit they can be at different times..Ill touch on this in a moment) What I do is choose a diagonal direction and head at least 700 to 800 tiles that way. Only 500 if looking for other live people. 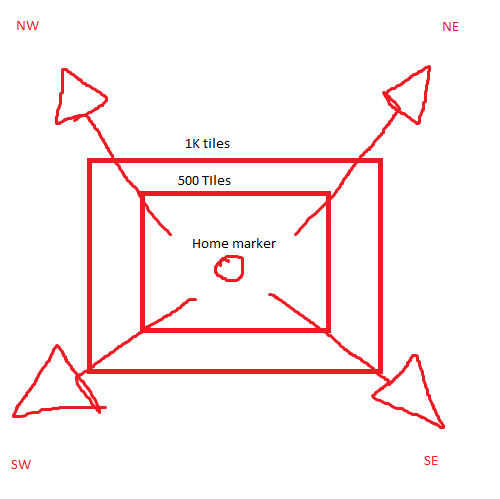 If nothing is found then I head back to my home marker or starting point and travel the opposite diagonal direction another 800 (or 500) tiles. All that distance traveled you SHOULD be looking for signs of player activity ( Cactus bearing flowers or fruits, family rabbit holes, ect.) If you find something worth stopping the searching at this point by all means check it out. If nothing is found, head back to start and travel the other diagonal directions you haven't gone yet. The diagonal direction which gives the most signs of activity will usually keep yielding results when gone in that that direction and sometimes seems to lead you into older ruins of previous days. You have a better chance at finding non related LIVE people the younger the generation you are. A generation 2 or 3 person has a waaaaay better shot of finding others non related than someone generation 30. It takes roughly 4 to 5 minutes to travel 800 tiles, so if looking for different no relation people travel 500 tiles in each direction FIRST not 800 to maximize the chance of finding. Avoid jungle! It might not be the fastest, but if you can go around a jungle or go through it at a very shallow point it is highly recommended. If no backpack, at least make a basket for you traveling. So there are a couple things I have come across in my travels that have helped me and I wish more people would do them. If people wont experiment with this method they can at least do these things to help us out. Stone arrows or any other arrows are always helpful to us, and even to a lost rabbit/iron hunters from your village who forgot to throw a home marker down. I've wandered across a few in my time and used them. Well as eve you should always try to find the best spot in the quick time, but many get overwhelmed and just say here is good way to early. MY personal goal with this data is to try and make double lineage towns. When my eve mom is dead weight and I'm a girl it would be better to find a better start. I'll get old enough to go search immediately and try to join a different eve in a good spot or start my own better spot if I can't find anyone. I NEVER suicide in this game but I can understand not everyone plays like this. I'm tryin to give options not to just suicide because you feel like there's no point. My biggest question is... how do you estimate the number of tiles travelled? Especially once you start going around the inevitable jungle? Maybe four in a half to five minutes of running to get 800? Sounds about right but I just guesstimate when i do this a lot haha. Yeah when I'm young and finding a different family it usually only takes two to four minutes because the spawns are pretty close. So that sounds pretty accurate.. but made me think about it, and need to update the post a tad bit. There's a piece of software you can run in the background which tracks your current coordinates relative to your spawn point. I think Tarr has a link to it; it's been mentioned on the forum recently but I couldn't find the post. Otherwise - Just estimate distance based on time spent moving. It doesn't have to be exact, or even close. When I've gone chasing the bell, I've traveled roughly 100 tiles every minute; that was on foot, naked, carrying a basket and sharp stone, and stopping as needed to forage off the land while avoiding jungles and dense trees in swamps. You can see how far you travel (and how quickly) if you are heading towards (or away from) a bell, or if you get more than 1000 tiles from your home marker. Grim: Good post! I think the real key is scouting to find the direction with the highest concentration of activity signs, and then heading that way. I'm not sure it matters whether you go orthogonally or diagonally. The Eve spiral is, well, a spiral, and in most cases it'll be very close to a circle. You could have spawned anywhere on that circle, and so the other camps could be in any direction. I keep meaning to test and see whether diagonal travel has a speed advantage. I suspect that it does - I suspect that your movement rate is a fixed X moves per second, where one move can be either orthogonal or diagonal, which means that moving diagonally will actually let you move a larger distance in a given amount of time. In which case you're absolutely right, moving diagonally would be the right thing to do when searching. Thank ya, and my passion for diagonal travel is probably just based on my trials and what works best for me, but originally I figured that if your going diagonal on a spiral you have a better shot at hitting the points first try than going the cardinal directions but it really is a craps shoot. The larger distance over time thing sounds pretty plausible. I have found that just sighting things while traveling diagonally is easier to me though be it ruins or people running about. I think you are right about diagonal walking speed being faster. Also, moving diagonally allows you to see more tiles than moving orthogonally since the view distance is square and not circular. OH yeah, Tarr tried to give me a link to it, and I couldn't make the link work. I think it would make more sense to go diagonal outwards and then circle around your home marker at a large distance slowly. If you double back, you're just revealing already revealed territory. Just a note: I used to make arrows like you do (although I generally only give them one barb, not two). But a quicker way is to use two items of one type and a third of another; the dissimilar item is the arrow-head pointing the way. Since you're only placing half as many items, it's twice as fast to make. But a quicker way is to use two items of one type and a third of another; the dissimilar item is the arrow-head pointing the way. That's pretty good. I'd be a little concerned about it being ambiguous to someone not already familiar with it. I think most people would guess correctly, but not everyone. Also, I suspect a lot of people wouldn't even recognize it as a directional marker at all. But for anyone clued in, that's a pretty good marker. As you say, it's fast to make. Requires two different types of objects that are resistant to being moved, though. There was another thread recently about leaving signposts and arrows, including my own recommendation. Exactly like that. It's more time-efficient, which means less food wasted while laying out arrows. As an Eve, I use them to point the direction I'm travelling until I make camp, then I make them pointing to camp while I'm out foraging and/or scouting. Not for me so much (unless I forget my home marker again XD), but for others. That is the problem with it, but it's not a hard conceptual leap. Especially when it's something like two milkweed seeds and a carrot seed. They can't just have fallen like that... it's a sign! And you only have two choices of which way to follow it, so... flip a coin. This is more a rough-and-ready way to indicate "I was here, headed *this* way" than a permanent signpost, since I'm generally removing tree limbs (pulling them to reset the timer on the trees) and picking milkweed... so there's plenty of material. I saw it... I just didn't feel like chiming in. I was curious; I knew that method didn't originate with me, but I didn't remember where I picked it up, so I went digging. I found it here: Nomadic life. You also contributed to that thread; I'm surprised you didn't pick up on the trick then. When you are cutting down trees for a path, pull out a piece of firewood every so often and set on the side of the trunk towards town. That way if you make a long cut path through the woods and I come across it, I have an idea which of the two ways to go. 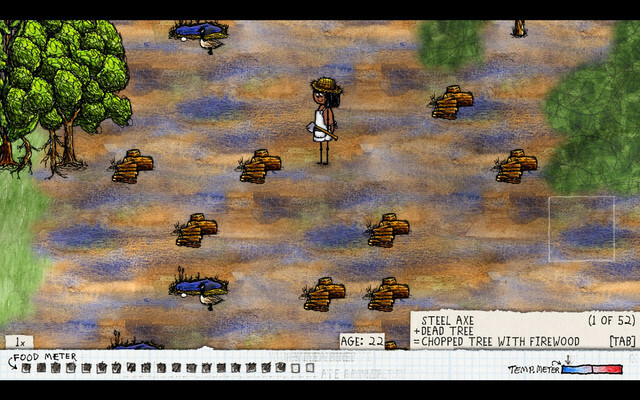 I've been burning axes this way for a long time, making cardinal roads that radiate out from the center of the village, but since the jungle update, I've been spending most of my time cutting down all the trees in the jungle and spreading out the wood to trap the mosquitoes in the most distant corner. Sometimes that job can take several lifetimes, but the payoff for a town that grows onto that jungle is well worth it. Really wish more people would help pushing mosquitoes, I need people helping that don't get bit every minute and know to get off the jungle when they do. It's frustrating when the only person willing to help sometimes is someone who does so fully clothed, then once they get bit, their instinct is to run to the berry patch on the desert. Thanks to those of you who tell people to get off jungle and desert tiles if they get bit. I've lost track of how many times I've said it but I'm sure it's at least twice now for every person that plays the game, and it still keeps happening. Maybe that's just a good sign that there is still a healthy influx of new players. Try to make their first experiences positive ones, please; more deep breaths, less drawn weapons? In regards to the cut tree paths, I tend to keep them 1-3 spaces wide and if I'm going horizontally those 2 -3 extra spaces are below the path that I imagine will some day be a road, that way none of the tree tops are blocking the view of the tiles the road would be on. I've been spending most of my time cutting down all the trees in the jungle and spreading out the wood to trap the mosquitoes in the most distant corner. Oh, I guess that was you I saw yesterday. I said "WHY NOT STACK" and you said "TO TRAP MOSQUITOS" and I was like "OH RIGHT GOOD IDEA". Thanks to those of you who tell people to get off jungle and desert tiles if they get bit. I've been telling people "GET COLD" but that's probably a mistake, since they probably have no idea what temperature means. Probably need to say "GET COLD" and then one second later say "GET OFF JUNGLE", or maybe vice-versa. They need to know what to do (get cold) and how to do it (get off jungle), or alternately what to do (get off jungle) and why to do it (get cold). The two together will probably spur faster compliance than either one alone. Yeah whenever born into a jungle village i immediately put things on all the tiles and tell people to keep them there. Then I build the mosquito wall. Yesterday in the spoon village I put all the bones in the only jungle spot next to the village. I placed them along the rim of the biome and they worked great as a barrier. When people came across it they turned around because they knew nothing good would come of heading into a jungle filled with bones. I also name every firstborn son Rune so yesterday (and like a day before with previous spoons?) my son had my favorite name I've ever so far in this game. My family died out on me at one point today, so I ran in the proper directions. 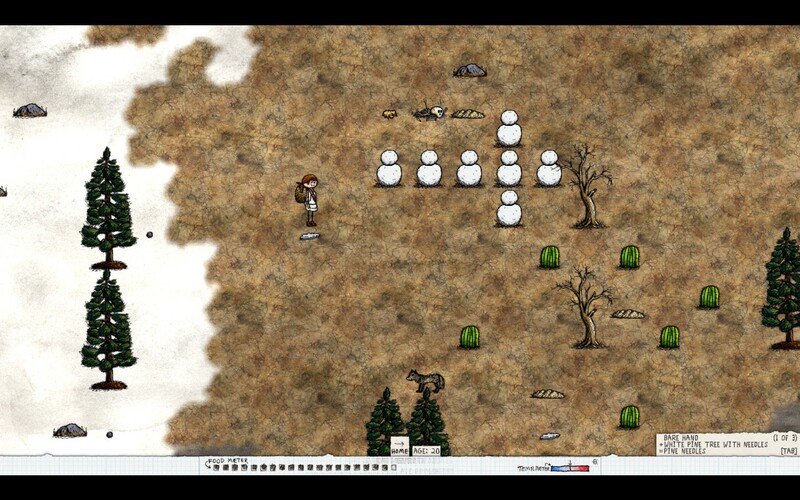 I had fun finding tons of dead towns, but was sad to find no other living villages. And no one left me an axe.